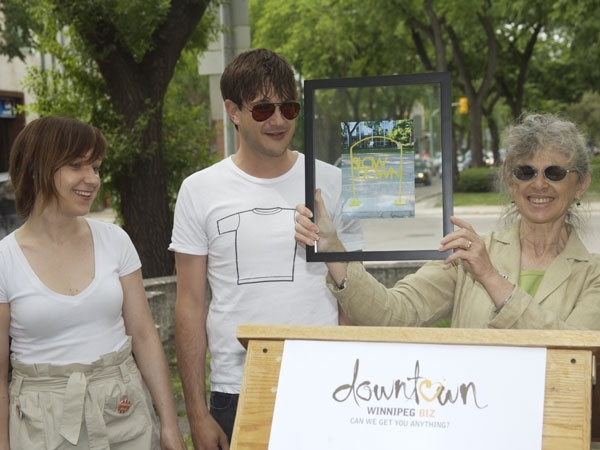 The Winnipeg Arts Council collaborated with the Downtown BIZ on this initiative to bring artist-designed bike racks to central Winnipeg. 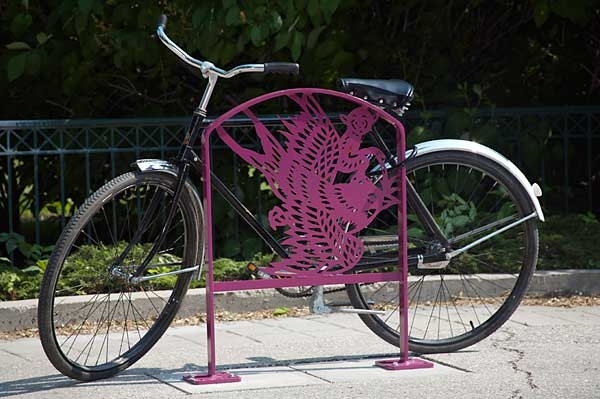 A Call to Artists was issued in spring 2007 for designs that would be made into bike racks. Sixty-eight artists responded enthusiastically with a total of 275 drawings. 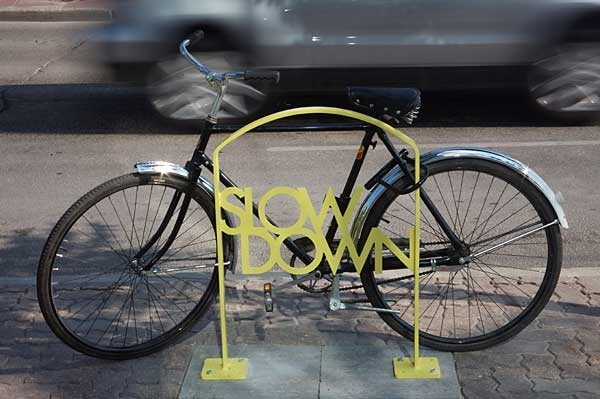 A jury of cycling enthusiasts and artists selected the final three designs. 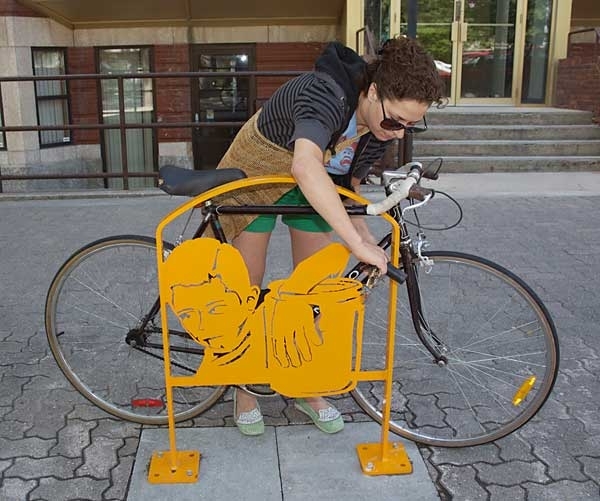 In collaboration with the artists, the drawings were transferred to digital files and slightly adapted in order to meet City codes and fit the criteria for a functional bike rack. The designs were then sent to the fabricator, Speciallaser Tech, who laser cut the designs into the steel plates. The racks were later painted with durable automotive paint. The BIZ and WAC chose the locations on Broadway, from Union Station to Kennedy Street, according to apparent need for bicycle lock-up, space allowance and for greatest visual impact. 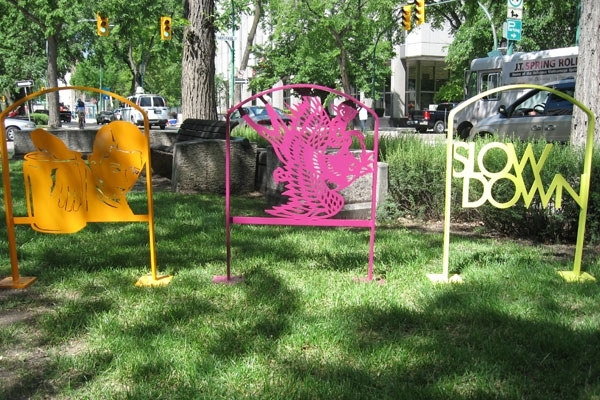 In addition to Broadway, two bike racks are installed in Bonnycastle and McFadyen parks. This project has caught on in a big way and has become a model for other cities. Jessica Koroscil has a BFA Honors Degree in drawing and graphic design. Her favorite color is hot pink, she enjoys strong coffee and good books. She keeps herself busy with a freelance graphic design and illustration firm. Paul Butler (b. 1973) works simultaneously as an artist (since 1998 he has organized the globally-roving "Collage Party" project), curator (currently, he is the guest curator of the Plug IN ICA’s Overlooked Space), and as the director of Winnipeg's Other Gallery. 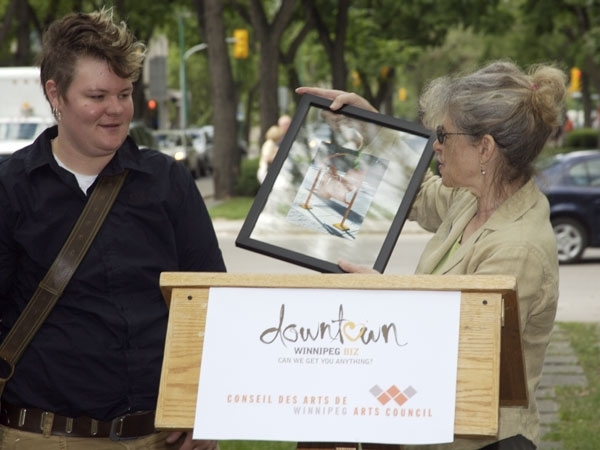 Vanessa Kroeker works with local and international artists and arts organizations towards the funding, creation, and presentation of contemporary art. She currently holds the position of Curatorial Assistant at Plug In Institute of Contemporary Art, and is studying philosophy at the University of Winnipeg. Her work has been shown at Printed Matter (New York), and Eye Level Gallery (Halifax). Born in the Philippines, Paul Robles is a Canadian artist based in Winnipeg. Recognized for his intricate origami cut paper works, Robles combines the delicacy associated with fine and traditional handiwork with psychological and emotional states, ranging from animist familiars to trauma and grief. He holds a Bachelor of Fine Arts degree (Gold Medal) from University of Manitoba School of Art and Bachelor of Arts degree (Sociology) from The University of Winnipeg. 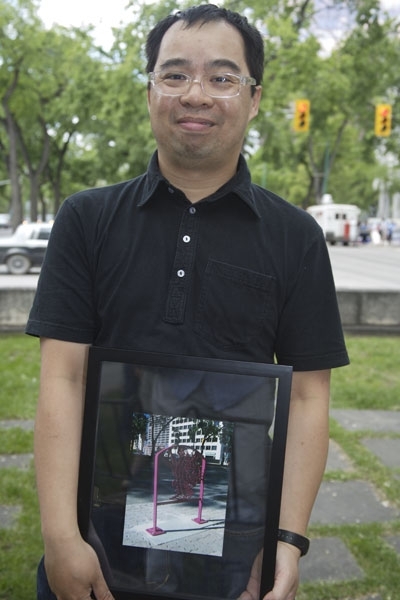 Robles has exhibited in Paris, France (La Maison Rouge & Grand Palais), New York City (Julie Saul Gallery), Ottawa (Rideau Hall), Toronto, (The Drake Hotel), Vancouver (Malaspina), West Hollywood (Antebellum) and Winnipeg (Plug In ICA & Winnipeg Art Gallery). He has participated in Plug In ICA’s 2011 Summer Institute Residency; collaborated on writer Roewan Crowe’s novel (2014) Quivering Land, published by ARP; and participated in the Wall-to Wall Mural Festival, 2015. In June of 2016, he presented a new exhibition, Honey from a Knife, at Lisa Kehler Arts + Projects.